Last updated: January 2019. Please contact us if you have further information. - Bannerman Arsuna 2b7 added. - A lot more auctions of East Turkestan prints listed. - Bannerman Aacheng 2a34 added (Poly 17 December 2017, lot 2532). - Eulogy of Fude (1a6) bannerman painting auctioned at Christie's London. - Bannerman Eerboke 1b39 added (Nagel 9 December 2016, lot 263). - more new bannerman paintings added (formerly Berlin). - images of red lacquer panels 3.7 and 3.8. - 13 Jinchuan Campaign prints auction at Christie's NY, 5 April 2015. - High-res images of red lacquer panels 3.4 and 3.5. - third Qurman painting fragment added (see Orientations May 2015). - more than 10 new bannerman paintings added (formerly Berlin). - Oilpainting of Urtunasun, 2b29, added. - More battle print auctions added. - German copies of Helman prints 1-11 added (by the Academie Imperiale). - Oilpainting of Ma Quan, 2a18 (Jinchuan campaign), added. - Model drawings 1.4, 1.9 and 1.11 added. - Copperplate 1.4 and 8.2 added. - Red lacquer panel 2.15 (Jinchuan Campaign) added. - Bannerman painting Yan Jin Bao (Taiwan, 2nd 30 Series, Nr. 16) added. - Bannerman Burha, 1b29, added. - Bannerman Tamanai, 1a44, added. - another unidentified Bannerman added. - Oilpainting of Ubasi, no. 1 Turgut - / Khoshout - Serie, added. - Oilpainting of Bambar, Turgut - / Khoshout - Serie, added. - Bannerman San Yinku / Sainku, No. 18 (Taiwan 2nd 30 Series) added. - Bannerman Gao Tianxi, 1a22, added. - Oilpainting of Aldanca, 1a49, added. - Oilpainting of Sangqiduoerji, 1b4, added. - Bannerman Eldemboo, No. 8 (Taiwan 2nd 30 Series) added. - Muslim Rebellion battle paining Sotheby´s NY, 19/20 March 2013, lot 449. - Sale of Taiwan red lacquer panel 1923 sales 3.10 and 3.11. - More auctions on conquest engravings and red lacquer panels. Sotheby's HK, 9 October 2012 (pdf); auction cancelled, private sale. - Cemcukjab (1b6) for sale again: Sotheby's NY, 11 September 2012. 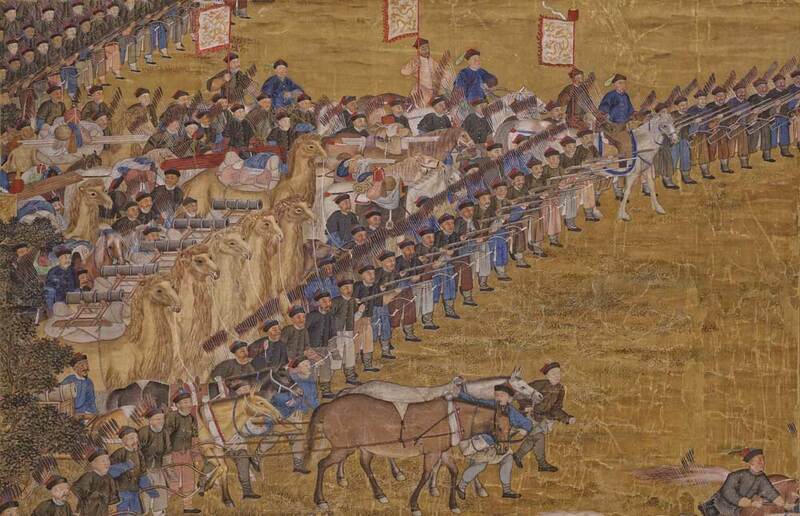 We are an open group of international researchers on the Chinese East Turkestan (and other series) battle paintings and prints. Everybody is most welcome to contribute to this website and share knowledge on this subject. 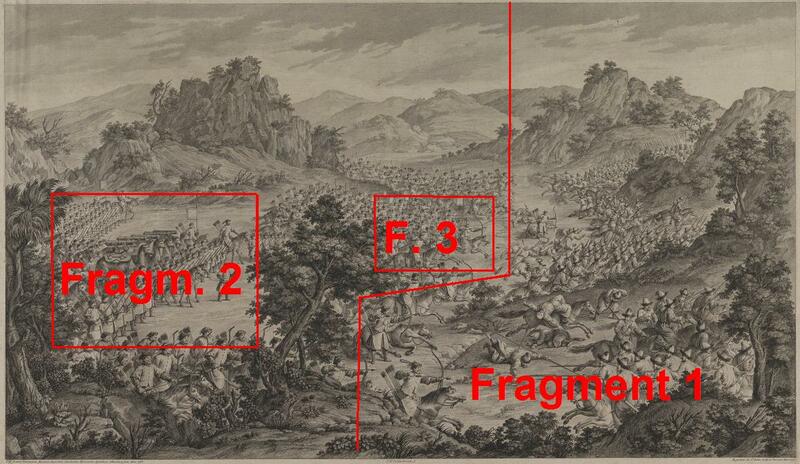 The main subject matter is the famous original painting Battle of Qurman from the great Chinese Qianlong emperor from 1760 from the Hall of Purple Glaze. In recent years three fragments of this painting have come to light. 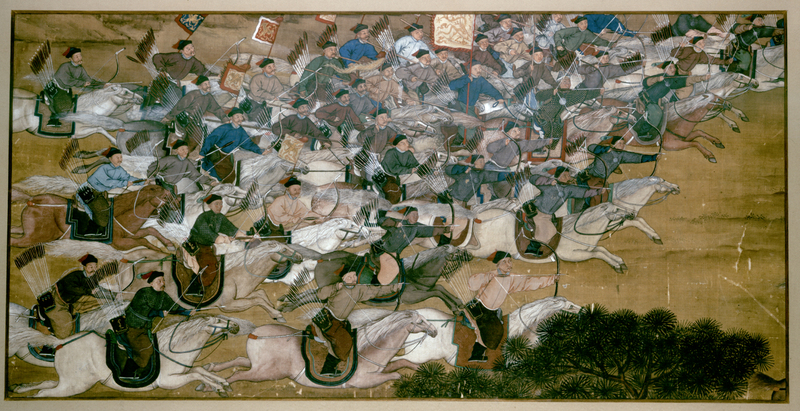 The painting Battle of Qurman was ordered by the Qianlong emperor in the year 1760 as a coproduction between Chinese court painters and European missionary painters and was hanging together with other paintings in the Hall of Purple Lights, the Hall of Fame of the Chinese emperors. During the Boxer uprising 1900/1901 the Hall of Purple Lights was looted and most paintings are lost. From the original battle paintings only one single fragment was long known to exist, which is the right part of the painting Battle of Qurman in the archives of the Ethnological Museum of Hamburg. In recent years however two more fragments have resurfaced. To explain the historical context of this subject we have put a few important articles from the last millennium on this website for download (see Literature). If you have any comments for us or you object to the downloads please send us an E-Mail to qianlong.research@163.com.